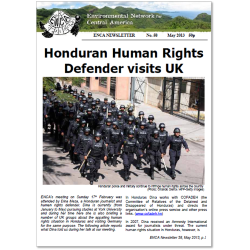 Honduran Human Rights defender Dina Meza talks of her struggles following her visit to the UK. We hear from James Watson as he reports back on our ENCA-supported ‘CMO cooker’ project and our presence at the 10th Election Observation Mission in El Salvador. Doug Specht gives a round-up of Mining News and OFRANEH report on the impact of coastal erosion and Climate Change on Garifuna Communities in Honduras.